For answers to shipping questions Please press the button below. There is no minimum order in dollar value or quantity. Shipping is flat rate $8.92 per order. Do I need a business or business number to buy from us? You do not need to have business to buy from us. We understand that many of our customers are creating balloon bouquets or decorating party halls for fun or a part-time income. We have no minimum order and flat rate shipping. We also Accept School Purchase Orders. 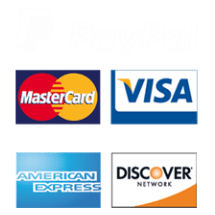 All major credit cards, debit cards and Prepaid Cards with Credit Card Logos are accepted through the online checkout including Visa, Mastercard, American Express and Discover. We also accept Paypal and Bank Transfers for larger orders. Unfortunately the cost of COD has become to high so we no longer ship COD. Yes. All credit card processing is done on a secure server. Our site is also checked daily by McAfee Secure. In order to offer the lowest possible prices we do not offer credit to our customers. Yes. We will accept school purchase orders and will at our own discretion accept a P.O. from known charity groups and some other organizations and companies. We reserve the right to refuse any Purchase Order. Call us at 1-866-330-1272 to see if you qualify. To place a school P.O. order. We accept school P.O. 's directly through the online checkout. Add your items to the cart and once completed choose the Pass Along option at checkout. We will then reserve the inventory for up to 10 days. Your order will be packed once you fax your school information on school letterhead to 805-357-5944. Fax us a copy of the Purchase Order or the following on school letterhead. (2) The P.O. number if your school issues P.O. numbers. -the name of the person in charge of paying the invoice. -the phone number of the person in charge of paying the invoice. Do you print a Catalog? Catalogs are very expensive to create, print and distribute so we only use our online catalog to promote our product line. This allows us to offer lower prices, but also allows us to add new products quickly whenever manufacturers offer us special deals which we can pass along to you at lower prices. Are your balloons self sealing? All mylar balloons 18" and larger are self sealing. Mylar Balloons 14" and under require heat sealing and are airfill only balloons (they will not float with helium). This is the same across all North American balloon manufacturers. If you have any other questions please e-mail us. This site has been designed by Special Buys Clothing Company Inc. The logos are owned by Special Buys Clothing Company Inc. Special Buys Clothing Company Inc operates this site as a wholesale mylar balloon catalog.